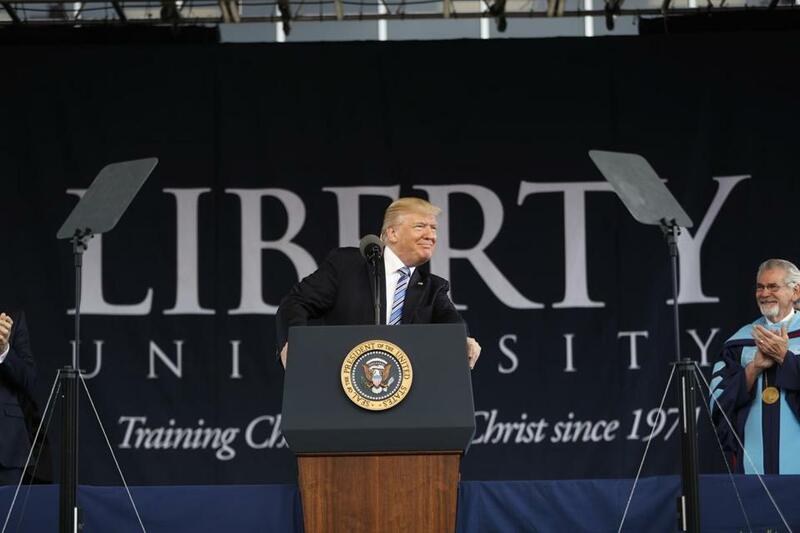 President Trump gave the commencement address at Liberty University in Lynchburg, Va., on Saturday. ‘‘It’s the outsiders who change the world,’’ Trump declared in his first commencement address to more than 18,000 graduates of Liberty University, a Christian school whose president was one of Trump’s earliest and most outspoken supporters during last year’s presidential campaign. Trump kept to a largely upbeat message during the roughly 30-minute speech, never mentioning his stunning decision this past week to remove James Comey as FBI director. Trump said Comey is a ‘‘showboat’’ and ‘‘grandstander’’ who was fired because he wasn’t doing a good job. But the timing of Trump’s decision raised questions as he remains frustrated by FBI and congressional investigations into Russia’s role in the 2016 presidential campaign that ended with Trump’s election, along with possible ties between Trump associates and the Russian government. ‘‘Remember this: Nothing worth doing ever, ever, ever came easy,’’ he said. Tens of thousands of people packed an on-campus stadium to welcome Trump, the second sitting president to address the university’s commencement ceremony, with applause and a standing ovation. ‘‘Following your convictions means you must be willing to face criticism from those who lack the same courage to do what is right, and they know what is right, but they don’t have the courage or the guts or the stamina to take it and to do it,’’ said Trump, who did not wear a gown. Trump won an overwhelming 80 percent of the white evangelical vote during the election, and a recent Pew Research Center survey marking his first 100 days in office — a milestone reached on April 29 — found three-fourths of white evangelicals approved of his performance as president. Just 39 percent of the general public held the same view. Christian conservatives have been overjoyed by Trump’s appointment of Justice Neil Gorsuch to the Supreme Court, along with Trump’s choice of socially conservative Cabinet members and other officials. But they had a mixed response to an executive order on religious liberty Trump signed last week directing the IRS to ease up on enforcing a rarely enforced limit on partisan political activity by churches. Trump also promised ‘‘regulatory relief’’ for those who object on religious grounds to the birth control coverage requirement in the Affordable Care Act health law. Jerry Falwell Jr., Liberty University’s president who endorsed the thrice-married Trump in January 2016 just before that year’s Iowa caucuses and became a key campaign surrogate, praised Trump’s actions on issue that concern Christian conservatives. ‘‘I really don’t think any other president has done more for evangelicals and the faith community in four months than President Trump has,’’ Falwell told The Associated Press in a telephone interview on Friday.